These spectacular paintings are made within few minutes on an aqueous surface by artist Garip Ay. He uses a beautiful Turkish art method called Ebru art or paper marbling and can produce patterns similar to smooth marble on water surfaces. In his work as an Ebru artist, Mr. Garip Ay has held numerous exhibitions, workshops and seminars around the world, from his native Turkey and the Persian Gulf region to Scandinavia, Russia and the USA. He has also taken part in various film projects like a 180-part TV documentary series, music and concert videos and public shows. Garip Ay began his art education in the painting department of the High School of Fine Arts in Diyarbakir in 2000 and later graduated with a degree in traditional Turkish arts from Mimar Sinan University in Istanbul. The patterns are the result of color floated on either plain water or a viscous solution and then carefully transferred to an absorbent surface, such as paper or fabric. 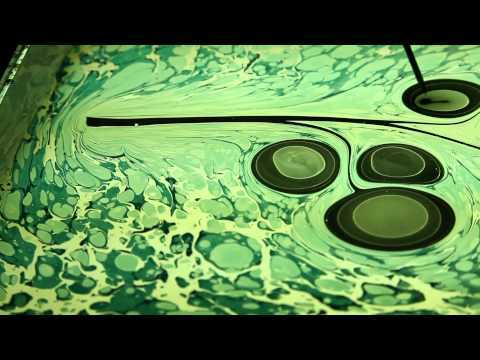 Through several centuries, people have used Ebru art methods to apply marbled materials to a variety of surfaces. Watch this video of Mr. Garip Ay creating beautiful paintings using this paper marbling Ebru art techniques. Next story Shocking facts: What happens if a top predator species vanishes from our ecosystem?